OrthoHorse offers a holistic approach to health care, for both horses and humans, in addition to a non-force approach to horse training through liberty work. *Ortho-Bionomy for both equine and human, a non-invasive, effective bodywork modality that can be useful in the treatment of trauma, soft tissue injuries, chronic and acute injuries, emotional issues, and much more. It accesses the central nervous system and supports the body's self-corrective response. *Horses at Liberty Foundation Training, another arm of OrthoHorse, complements Equine Ortho-Bionomy as it is a study of the way horses communicate with one another and teaches us how we can communicate with them in a way they understand. I also work with people on the way their energy impacts whether they are effective in their work with horses. This way of working with horses allows for relationships between people and equines to flourish and leads to better communication and performance. 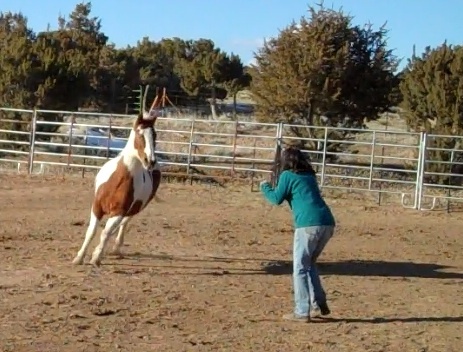 As a trainer and lifelong student of horsemanship and bodywork, I bring this work, to you, based on basic dynamics that horses engage in naturally that are vital to their survival and successful energetic human interaction. The initial work is done without any tack or fences, ultimately creating a more willing partnership. Ortho-Bionomy was founded by Dr. Arthur Pauls, a Canadian osteopath, who outlined the principles by which the work is practiced today that guide both the physical work and the energetic work. The word Ortho-Bionomy comes from the Greek - "ortho" meaning correct, "bio" meaning life, and "nomy" meaning study. I named this website "Orthohorse" which literally translates to "correct horse." The "correct" in Ortho-Bionomy refers to the body's ability to self-correct, which is inherent in all living things. The horse work is an adaptation of Ortho-Bionomy, which was originally designed for people. I also work on people. Ortho-Bionomy is a comprehensive bodywork study that addresses all body systems and relies on the body's innate ability to self-correct. This is what distinguishes it from other forms of bodywork. Ideally, the self-corrective mechanism becomes nourished through the work and can operate on its own, without continual sessions. This will depend, of course, on the health of the organism and its ability to process. The work can have deep and lasting effects as the body grows more empowered and self-healing. I invite you to also go to the Horses at Liberty Foundation Training page which will be added to on a regular basis. If we learn and practice these equine dynamics at liberty from our hearts, we become better leaders able to create a magnetic bond with our horses. Look at the Schedule of Events for upcoming clinics and tutorials in 2015! We are excited to announce the Sahaja 2015 Clinic in St. Vincent. Stina and Susan will host the clinic on the beautiful island of St. Vincent in the Eastern Caribbean. We are in the process of developing the program that will focus on how to connect with horses from the ground and from the saddle. The clinic is limited to 10 participants and the accommodation is at The Richmond Vale Nature and Hiking Center. How to get to St Vincent: Fly to Barbados or Trinidad with BA, Conor, Virgin, American Airlines or United Airlines. Fly with LIAT to St. Vincent. Post by Horses at Liberty Foundation Training. Look for videos from the Horse Fair!